Beer Brother Mark came over to watch the Tour de France and help me sample of canned growlers I hand purchased recently. 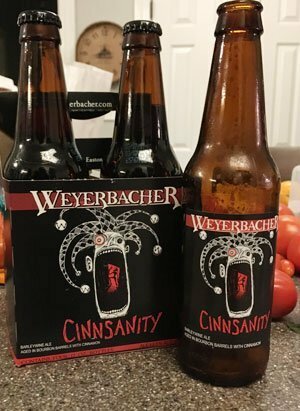 He stopped at Toast and got a 4-pack of Weyerbacher Cinnsanity. I’ve had several of their brews and really like their Weyerbacher Imperial Pumpkin Ale. This is actually a barley wine. The front label says “Aged in bourbon barrels with cinnamon.” I can’t say that I can taste the bourbon barrel flavors. That’s because the cinnamon is over the top. I went back and did a database search of cinnamon brews I’ve tasted over the years, lots were pumpkin ales (including Dogfish Head Punkin Ale and New Holland Ichabod Pumpkin Ale). And I’ve had Weyerbacher’s Blithering Idiot which is a barley wine. Most of the others are Winter Warmers or Christmas Ales (Harpoon Winter Warmer) and others like Bison Gingerbread Ale and Sam Adams Merry Mischief. Now this is a barleywine so it will have a different mouthfeel and profile from these ales. But dadgum. I think the brewmaster got distracted and used the barley measurement for the cinnamon. It is insane with cinnamon. We drank it cold but I think it is better warmed up. I’m still waiting for the cinnamon flavor to go away. My complaint about the Bison Gingerbread Ale was that the spices made for an extremely dry beer. It was like a cinnamon roll without any sugar. 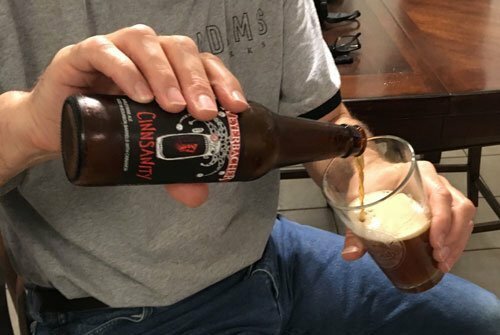 The Cinnsanity has the barleywine backbone to provide enough sweetness to keep it from being a dry baking spice brew. Okay, I guess I need to go find their Insanity, a seasonal released in January, and see the difference. Mark said he loves it. This is actually the second time he’s bought it. Now I’m dying for some sugar cookies.